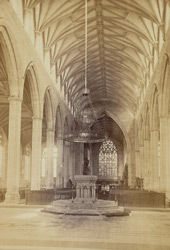 Interior view of Saint Botolph's parish church in Boston, Lincolnshire. "On entering the Church either through the west door, or south-west porch, the eye is at once struck with the vastness of the interior, the whole of which, being unbroken by transepts or screens, and only interrupted by light arcades, is taken in at one glance...The great defect in the interior is the loss of the ancient roof and the substitution of a meaner one 22 feet below the original pitch, which has the effect of destroying the beauty of the clere-story, and gives a depressed apperarance to the nave. The wooden roofs of the aisles are of a still more debased type." Text by the Vicar of Boston G B Blenkin from the book 'The Fen and Marshland Churches'.